First of all sorry for the inactivity this past week, but what can I do, it just happens sometimes. 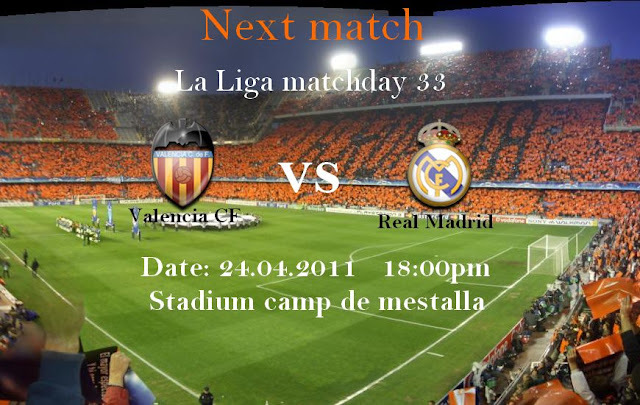 Anyways its this time again, Valencia CF faces the big guns Real Madrid in a basically season defining match. If Valencia CF win this match its done, they are going to finish 3rd place, it would be impossible for Villarreal in any way to finish above Valencia. Real Madrid on the other hand would most certainly finish in 2nd place, but after their recent success against Barcelona in the Copa Del rey, winning 1-0 over their fierce rivals, Real Madrid would be looking towards the champions league as that is more important to them now, winning 2 titles over Barcelona 1 Spanish title would be success for Real Madrid. Valencia CF are actually coming to this match as favorites, I know how this sounds, but its true. Real Madrid just won over Barcelona 3 days ago in extra time no less and Jose Mourinho is going to rest most of his important players, such as Xavi Alonso, Ronaldo, Di Maria... So they should come out weakened in this match and Valencia CF should take advantage. Valencia CF on the other hand have had a full week to recover and prepare for this match and should be in better form to take this match. The only player that is unavailable right now is Tino Costa, but otherwise all of the players are available and this should be an exciting match. Emery has been practicing with the formation played against Villarreal again and the plan is to keep the ball as much as possible and also when the ball is lost to quickly pressure Real so they loose the ball too. Its very likely Roberto Soldado will be the sole attacker once again, with Mata and Pablo on the wings, supported by Ever Banega and most likely Topal, although who knows as Emery has been playing Topal as defender in couple of matches. Defense: Miguel, Dealbert, Ricardo Costa, Stankevicius, Mathieu, Jordi Alba. Midfield: Albelda, Maduro, Topal, Éver, Joaquín, Pablo, Mata. Real Madrid are coming from a huge 1-0 win over their fierce rivals Barcelona. After suffering for 3 years domestically and even more years internationally, since the last galacticos era, Real Madrid have been under performing, each year they throw money at the problems, 40,50,80 millions of euros and still unable to win anything. This season they have been rebuild and under the tutorship of Jose Mourinsho, arguably the best coach in the world Real have been able to break their "curse" in the champions league, beating Lyon, then totally trashing Tottenham and in the next round they face their biggest rivals Barcelona. Real Madrid hold the advantage as they lost one game, drew one, but won their last game in the copa del rey final against Barca and they have 2 more matches in the champions league, but they are going to go into them as favorites. Since Real Madrid are 8 points behind Barcelona and even though there are 6 more matches to be played the battle is pretty much over so they should rest their best players against Valencia CF and this could give Valencia a chance to win and ultimately confirm that 3rd place finish. Tactical: low defensive line, mid field opposing team pressure, wing and central attacking play, mostly short passing with decent amount of crosses from the wings. This is defenatelly a very interesting match and you shouldn't miss it for anything. Valencia CF are the favorties coming into this match jsut because Real Madrid should rest its best players and Valencia CF is in good form right now, the players are performing so I think we should be able to win 1-0.